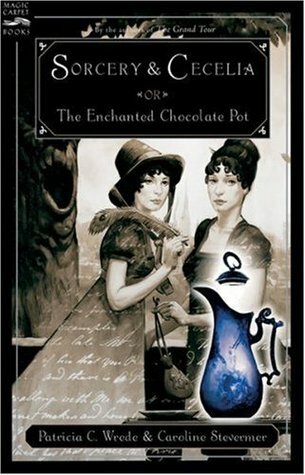 The events in Sorcery & Cecelia, or The Enchanted Chocolate Pot play out over a series of letters between two cousins in Regency England. Kate has been sent to London for a debut season — well, really her younger sister’s debut season, but since her younger sister can’t officially have a debut season in London until Kate has had hers, Kate has to endure a debut season as well. Kate is rescued from an utterly dreary round of balls when someone tries to poison her at the Royal College of Wizards. Capturing the culprit spices up the rest of the season quite nicely. Kate’s cousin Cecelia has remained quietly in the countryside, but still has plenty of exciting events of her own to write about. A strange man has started following her (although he is frankly quite terrible at it), and a series of strange incidents have made her wonder if she has magical powers too. I picked up this book, because I’ve been challenged by a friend to complete the BookRiot Read Harder challenge for 2019 and I needed an epistolary novel for one of the tasks. The Eleven-Year-Old and I enjoy Wrede’s wry sense of humor so much that we make a point of reading every Wrede novel that comes our way. So when I discovered Wrede had co-written an epistolary novel, it only made sense to give it a try. Just as I hoped, this book made light work of the epistolary novel task. The letters are light-hearted and paint a vivid picture of the events in the story. In classic Wrede style, the humor is never neglected, even as the cousins realize that they have stumbled onto two ends of the same dastardly plot and the stakes continue to rise. Even the Author’s Note at the back of the book is well worth reading. In it, Wrede and Stevermer explain how they wrote the book as part of the Letter Game. To play the Letter Game, the authors told each other a story over a series of letters exchanged over several months. Each author’s narrative had to depend at least in part on developments in the other writer’s story. But, critically, neither of them could tell the other where they intended to take their half of the story. They had to reveal it slowly over time as part of the game. Part of the fun, after all, is to maintain a coherent narrative even as your writing partner randomly throws narrative bombs at your plot. The only coordination the two writers did came toward the end, when one asked the other how many more letters she needed to wrap up her narrative, so that she could be certain to wrap up her own at roughly the same time.